This is just a little plug for Namaste Brownie Mix....these turned out extremely well and tasted just like regular brownies. I purposely underbaked them - only 30 - 33 minutes in the oven instead of the recommended 35 - 40 - and also added only 2 eggs instead of the recommended 3 (because more eggs = more cakey brownies, and I like mine fudgey), and they were extremely moist. I probably could have baked them for another 3 - 4 minutes and been fine, but since it was my first time baking with this mix, I wasn't sure. In any case, I would highly recommend this mix!! My friends who know me well will laugh when they see this post. I am mocked enough as it is for my undying love of peanut butter and maple butter spread, swirled perfectly over toasted bread. I ate this literally every day for lunch for over a year. And I am not sick of it yet. But now I've taken it to a whole new, borderline obsessive level of food love. All day today, I have felt like my stomach was being wrung out like a wet rag. I've just felt like my whole body was rebelling against me. I'm not sure what I did to deserve this all-out rebellion, but there it was, and when I finally got home after work, all I wanted to eat was a giant bowl of some kind of comfort food. What I really wanted was, of course, my favorite fallback meal - the aforementioned peanut butter/maple butter/bread concoction - but I was afraid that the gluten-free bread would fill me up too much. And I really wanted something oatmeal-like anyway. So I used some leftover cooked rice from my dinner yesterday, and made a very simple dish that had just the creamy consistency I was looking for. It tasted like my beloved peanut butter and maple butter, but it felt like I was eating a nice, soft breakfast food. Creamy Peanut and Maple Butter Rice Bowl 1 cup cooked rice (I used Jasmine) 1/2 cup rice milk 2 tbsp. organic creamy peanut butter 1 - 2 tbsp. maple butter (to taste) dash of salt In a small pot, combine the cooked rice and rice milk and heat over a medium flame. Allow the mixture to thicken, and when it has, melt the creamy peanut butter and maple butter into the rice and stir until well mixed. Heat just until it warms through and then remove from heat. Serve immediately. My friend Lisa, as I've mentioned, is an avid gardener, and almost all of the main ingredients in this sauce came from her garden. She often finds herself with a surplus of cherry tomatoes (I think at last count she had 6 different kinds growing in her garden), and I am always willing to lend a hand with helping her consume them. This time, she gave me a whole bag of different kinds of smaller tomatoes, as well as a bag of fresh basil and a few peppers. My other friend Katie supplied some roma tomatoes from her garden. This sauce was incredibly flavorful and didn't need much added to it in terms of spice; it just needed some time to simmer and develop its flavor. It was so good because the ingredients were fresh and home-grown; you can't beat having friends who garden! 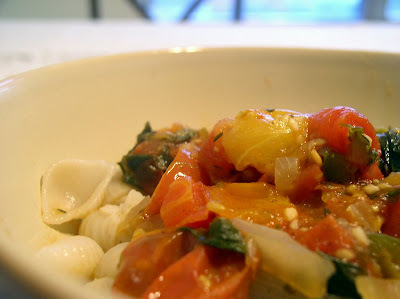 Pasta with Tri-colored Tomato Basil Sauce 1/2 cup brown rice pasta shells 2 cups assorted small tomatoes (I used tomatoes my friend Lisa gave me from her garden: cherry, yellow pear, and a few other kinds), chopped in half 2 fresh roma tomatoes, chopped finely 1 - 2 tbsp. olive oil 1 tsp. Earth Balance "Buttery Spread" 1 - 2 tsp. minced garlic 1/2 medium onion 3 tsp. minced hot pepper (I used Macho Nacho peppers from Lisa's garden) 2 - 3 tbsp. fresh basil, chopped 1 tsp. dried oregano 1/2 tsp. dried parsley Salt and pepper to taste Cook the pasta according to directions until it is al dente. While the pasta is cooking, heat the olive oil and "Buttery Spread" in a pot and add the garlic and onions. Saute over medium heat until the onions start to become translucent, and then add the tomatoes, minced hot pepper, basil, oregano and parsley. Bring to a boil, then reduce heat, cover, and let simmer together for about 15 - 20 min. (at least) to allow the flavors to mingle. Adjust the spices if necessary, but if you use fresh, home-grown tomatoes, the flavor will be incredible as it is. Serve over pasta and top with Parmesan cheese (or fake equivalent) and a few pieces of fresh basil to garnish. Yesterday I decided to break out the slow cooker that has been sitting, untouched, in my kitchen for the last year or so. I don't know why I had this weird aversion to using it for so long; I came up with all kinds of excuses not to use it. It was too bulky; I didn't have the time to cook something for 8 whole hours; and besides, it was "buried" in one of my cabinets and it would be too much work to get it out. (In reality, it took me less than 30 seconds to remove it from underneath the small, unobtrusive box of hot sauce that was sitting on top of it.) But then I realized...what was I thinking? It's such an amazing cooking set-up. You throw in all the ingredients and walk out the door, only to come back later to wafting aromas and a fully cooked meal. Did I seriously not use this the whole time because I thought it was too labor-intensive?? So I did a little poking around on the internet to try to find a recipe for chicken tacos for Lisa's farewell dinner (before she leaves for the Peace Corps on Saturday) at the apartment tonight, but I was unsatisfied with what I found. They all seemed way too simple - "Cook chicken pieces and plain salsa for 8 hours" - I don't know, I wanted a little more complexity of flavor than that. So I kind of winged this one and took elements of different recipes I found and then added my own twist as well. And I have to say, it turned out way better than most recipes I make up as I go along! It was thick and delicious with well-developed flavors, yet it wasn't overly spicy (you could fix that pretty easily, though, if you wanted to). I think this would also be amazing rolled up in gluten-free corn tortillas, or maybe over a bed of Spanish rice and having a taco salad kind of set-up. (Tacos are just hard for me to eat while containing the filling.) I hope you enjoy! Slow Cooker Chicken Tacos 1 lb. chicken, cut into bite-sized slices/pieces 1/2 medium onion, chopped 2 - 3 tbsp. chopped fresh cilantro (optional) 1 - 2 tbsp. olive oil 2 heaping tsp. chili powder 1 tsp. garlic salt 1/2 tsp. cumin 1/4 tsp. pepper salt to taste 1 can gf tomato sauce 1 can gf diced tomatoes with green chilies 1 can black beans, drained 3 tbsp. cornstarch mixed with about 1/4 - 1/2 cup water (so it is thick but not too watery) Chopped spinach Tofutti "Better than Sour Cream" (or real sour cream if you can have it) gf salsa (I used Newman's Own) Chopped tomatoes Non-cheese (I used Vegan Slices) (or real cheese if you can have it) Gf corn taco shells (I used Old El Paso Super Stuffers) Heat the oil in a copperbottom pan and add the onions, chili powder, garlic powder, and cumin. Saute until the onions start to turn a little translucent, 3-5 min. Add the chopped chicken and cilantro, pepper, and salt and continue to cook on medium heat for 5-6 minutes, until the chicken is slightly browned (but it does not have to be all the way done). Meanwhile, in the slow cooker, pour the cans of tomato sauce, tomatoes, and black beans, and stir. When the chicken is browned, add it to the slow cooker and cover. Cook on low for 6-8 hours (adjust spices to your taste). I cooked mine for about 6 hours and the meat was very tender and falling apart, but I think it could easily have cooked for another 2 hours and been fine. Mix the 3 tbsp. cornstarch with 1/4 cup water, then add more if it is too thick. You want it to be thicker than milk and not too watery. Add the cornstarch mixture to the chicken and stir in completely. Allow to cook a bit longer while it thickens. Serve in tacos with spinach or lettuce, sour cream, cheese (if you can have it), tomatoes, salsa, and guacamole.